After completing the registration process, members are typically marked as Active automatically. If your members are not being marked as Active and instead remain as Pending, this can be due to one of several common reasons. PayPal uses a system called Instant Payment Notification, or IPN, to verify payments are processed successfully before marking a member as Active. When the IPN is processing correctly, members will be marked as Active upon the return to your site. If members are not being marked as active, it's likely due to the IPN not working properly. This is the most common reason for members to not be marked as Active. There are several steps to take in order to determine if an IPN processing failure is the culprit. First, make sure that IPN sending is enabled inside of your PayPal account. Log into your account at PayPal.com and navigate to the My selling tools section under your profile settings. On that screen is an option called Instant payment notifications. Click that to view your IPN settings. Consult our PayPal Standard setup documentation for additional information on configuring IPN. Or, if using PayPal Express, consult our PayPal Express setup documentation. Please use the correct article for your PayPal gateway, as they use different IPN URLs. Note: if you are using Sandbox mode to test payments, you may need to configure the IPN inside of your PayPal Sandbox account as well. If members are still not marked as Active after IPN has been enabled, it is possible the additional verification of IPN messages that Restrict Content Pro is failing. In Restrict > Settings > Payments is an option called Disable IPN Verification. Check this box if members are still not marked as Active. There are also other reasons members can remain pending when paying through PayPal. PayPal accounts include an option to automatically (or not) accept payments made in a currency other than the account's default currency. If your account is not configured to auto accept non-default currency payments, members will remain as Pending until the payment is manually accepted inside of your PayPal account. 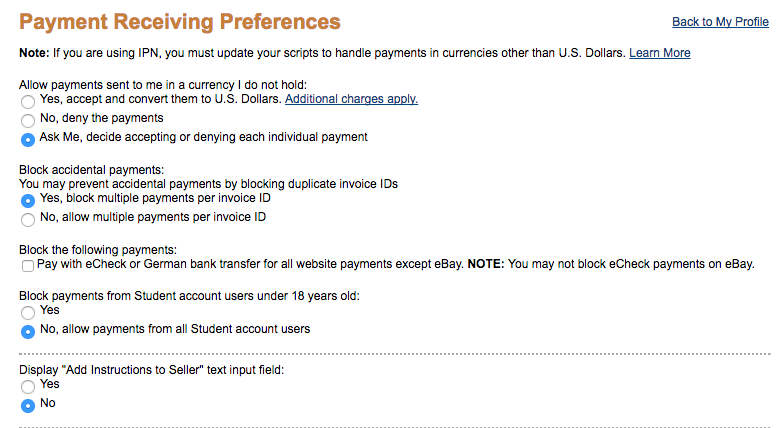 In the My selling tools section of your PayPal profile settings is a page for Block payments. This page contains several options that you will want to review to ensure payments are automatically processed (or not) how you wish. When paying with a credit / debit card through Stripe, member accounts are verified and marked as Active through Stripe's Webhook system. If members are not being marked as Active it is likely due to your Stripe account's webhooks not being configured properly. See the Stripe setup documentation for information on how to configure the webhooks. When paying with a credit / debit card through 2Checkout, member accounts are verified and marked as Active through 2Checkout's INS system. If members are not being marked as Active it is likely due to your 2Checkout account's INS is being configured properly. See the 2Checkout setup documentation for information on how to configure the INS.